Putin met with Accounts Chamber Chairperson. 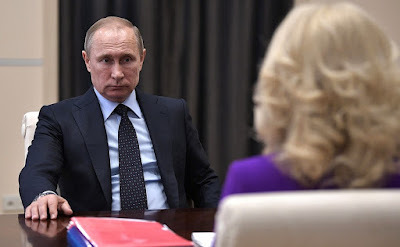 Putin.BLOG Budget Putin met with Accounts Chamber Chairperson. Vladimir Putin had a working meeting with Chairperson of the Accounts Chamber Tatyana Golikova to discuss the results of the organization's work over the first half-year and the state of progress on instructions given following the Direct Line event. Vladimir Putin at a meeting with Accounts Chamber Chairperson Tatyana Golikova. Ms. Golikova, let’s start with the results for the first six months. I know that you are using new technology now. You can tell me about this too. On a separate matter, there is also the question of the Direct Line instructions. There were three things I wanted you to look into, monitor the situation and ensure that everything is moving in the right direction. I want to share with you the results for the first half, not so much in terms of the quantity and amount of violations, though this is important too, above all for how federal budget money is being used. I want to say first that in 2014, we began modernizing our information systems in order to reduce inspectors’ work when preparing their checks, cut down the time spent away conducting checks, and make it possible to obtain more information locally using the extensive information resources that the federal agencies already have at their disposal. I think that we have achieved results here. In 2016, we launched the remote audit information system and have integrated into it the various federal agencies’ information systems. This means that we have online access to all the information and can use these information systems to track practically all violations without having to physically go to the site. The benefit gained here is that we can carry out preliminary checks without letting the situation reach a point where actual violations take place. We can step in at an earlier point to speak with colleagues and warn them that we see signs of violations in their financial and economic activity. We created and operate an information resource called The Internet Portal of Control and Accounting Bodies. Actually, of Fiscal Control and Auditing Bodies. It has 456 different agencies taking part, all of which are involved in one way or another in internal control. This vast quantity of data enables us to use a risk-focused approach in our practical work. In other words, we see where the volumes are higher, where there are more violations, greater risks, and where we should go with inspections. Increasing transparency in this way has brought to light more violations, and so we have a much higher figure for the first half of this year. Vladimir Putin with Accounts Chamber Chairperson Tatyana Golikova. A higher number of violations identified? Yes, that’s right. For 2016 as a whole, we had 3,845 violations totaling 965 billion rubles, but for the first half of 2017, we have 2,631 violations for a total 1.13 trillion rubles. If we average out the quantity of violations identified for each inspection conducted, in 2016, on average, each inspection revealed 15 violations for around 3.7 billion rubles, while in the first half of 2017, each inspection revealed 18 violations for a total 6.9 billion rubles. The most frequent violations are in budgets and accounting, and we are not talking about technical mistakes here. I spoke about this last time we met, but the problem has become even clearer now. There violations account for 62 percent of all violations and add up to 629 billion rubles of the 1.13-trillion total. What do these violations involve? As a rule, it is a case of not reflecting aspects of economic activity in the accounts and reports. To give a simple example, the Leningrad Region and St Petersburg branch of the Federal Penitentiary Service signed a contract for construction of a prison facility. The contract was not performed according to deadline. A penalty of 767 million rubles was imposed, but this sum was not recorded in the accounts and therefore will not be paid in as budget revenue. There are many such examples in practice. There are a great many incomplete construction projects that are not reflected in the accounts. As for other violations, they include infringements of the budget law. This category comes to a total of around 168 billion rubles. This includes, for example, violations in provision of budget loans to the regions by the regions themselves. Such violations came to 15.5 billion rubles in the first half. Violations in procurements came to 18.5 billion, and violations during computerization of federal agencies came to around 22 billion (these are violations that occurred in 2016 but only appeared in our report in 2017). What does this involve? We have a rule that before creating any information systems or carrying out any work in this area, the federal authorities must first coordinate their plans with the Ministry of Communications. This approval usually takes place with delays or is not carried out at all, and the Ministry of Communications gives it approval post-factum. We have briefed the Government on this matter and we hope that this situation will be rectified. In this context, another point I want to bring to your attention is that we noted that the qualifications of those working not at ministerial level but further down the scale leave much to be desired in terms of respecting financial and budget discipline. We decided to approach this situation from a fresh angle. The statistics might surprise you, and we will do a final review of results only in November, but we already have interim results that show what is happening in the system of state governance. Beginning in 2012 and through to 2016, the number of civil servants increased, and then in 2016, it fell by 5.6 percent, with most of the cuts being made at the bottom levels. We now have an increasing number of administrators. The number of deputy heads of federal authorities has increased by 18 percent, the number of department heads increased by 21 percent, and the number of directorate heads was up by 13 percent. I could continue. In the regions, the number of civil servants overall is down by 11.9 percent, but the number of people at the managerial level is up by 8.4 percent. There is a very worrying trend: The number of territorial bodies has decreased by 4.5 percent, but the number of subordinate agencies created by federal authorities to run their activities has increased by 25 percent. This is not to perform actual functions in say, healthcare or education, but to support the federal authorities’ work. Twenty-five-percent growth here is a very high figure. This is all extra budget spending, transfer of functions, and in some cases, bypassing law No. 44, in order to be able to carry out procurements under more liberal regulations. This, of course, is ultimately about the issue of effectiveness that we keep talking about. It seems to us that this system has grown out of proportion and we need to take serious steps to move forward now. Reflect on it and put forward your proposals. We will complete our work here by autumn and will draft our proposals, because many of these organizations feeding out of the budget’s pocket could be let go without the slightest problem. What about the instructions related to Direct Line? Mr. President, you gave the instructions to look into what happened in the Stravropol and Trans-Baikal territories. Regarding the Trans-Baikal Territory, other control and law enforcement agencies were there before us. We did not go back over what had already been checked, but focused on ascertaining whether all commitments regarding provision of housing to those affected have been met. We also examined what happened with funds allocated for agriculture and looked in general at whether the region makes preparations for the wild fire season. Fortunately, or perhaps unfortunately, I don’t know, we spoke with the region’s new heads and, understandably, they cannot answer for their predecessors’ actions, but we nonetheless drew their attention to the problems I will tell you about and asked them to remedy these problems without delay. Regarding the local residents, the set plans for housing provision were carried out, but the quality of housing provided is another matter. The subcontractor that built and repaired housing was, regrettably, not very conscientious, and so there are many complaints about the quality of the housing and of the repair work that was done. Furthermore, they used technology that is not suitable for this region, for example, they used so-called stretch ceilings that are completely unsuitable for the region’s climate. Of course, all of this has developed problems and lays bare the existing problems. But there is another problem too. You know well that the Trans-Baikal Territory has a large amount of dilapidated housing and housing unfit for habitation, but we are still a long way from completing the plans to relocate people from all housing recognized as dilapidated as of January 1, 2012. This housing stock was in part to be repaired and rebuilt, but it is probably easier to relocate people into new housing than to get it into proper shape. The regional authorities are now making claims against the subcontractor organization and have filed in court. We await the results of this issue’s examination. Furthermore, 31 million was allocated for agriculture. This sum was approved with the Agriculture Ministry, and overall, comparing it to the application the region made, the region’s agricultural producers should be receiving on average 81 percent for their activity. But for some reason other decisions were made and the new authorities do not know why. In other words, the internal regulation in the Trans-Baikal Territory differs to the one adopted at the federal level and they were using a differentiated approach, with some businesses receiving 45 percent and others receiving 91 percent. Now they are trying to sort out this situation. Obviously, it is not going to be possible to get the money back, even if it was not used for its designated purpose. We have identified particular violations and sent them to the regional authorities and asked them to eliminate these problems. As for the emergency situations, it has to be said that the forest management plans that are currently in force in the Trans-Baikal Territory have long become obsolete. These plans date back to 2008, and do not comply with the forest management regulations. Unfortunately, I have to report that preventive efforts, including flying over territories and efforts to clear roads and forests, were inadequate. However, there are also outstanding regulatory issues, as we have pointed out in our written report. The current laws and regulations fail to specify who should be in charge of putting out forest and steppe fires. As of today, no one bears responsibility for this activity, which, of course, affects the population. The Accounts Chamber and the Federal Forestry Agency [Rosselkhoz] pointed this out to the Trans-Baikal Territory authorities. The Federal Forestry Agency was involved in examining this issue. We do hope, and at least they have assured us, that all these shortcomings will be addressed, and we will not fail to report it to you once it happens. As for the Stavropol Territory, the situation there is quite different. I have to say that in accordance with the regulations (taking into consideration that the Government of the Russian Federation issued the relevant documents on time), the Stavropol Territory has started making payments from its own budget. However, under the current laws, it is not yet clear how the region will receive compensation from the federal budget for these payments, if what happened there is recognized as a federal-level emergency situation. Has the Government issued a resolution to this effect? No, it has not. There was no resolution on the compensation of expenses that were incurred beforehand. What do you mean by beforehand? They had an account balance that they could use to make the payments. They did pay. But we have a classification of emergency situations: there are federal-level, regional and municipal emergencies, and specific regulations apply to each one of them. If an emergency is recognized as a federal-level event, the expenses are to be covered from the federal budget. The Stavropol Territory started the payments. There were some delays in specific municipalities, which is attributable to the negligence of certain municipality heads. Today, all these payments are underway. We referred all the shortcomings to the prosecutor’s office on the spot. These include various corrections made in the documents and making payments to those who were not entitled to them. That said, if the emergency situation is recognized as a federal-level calamity, and if the region has already made the necessary payments, they cannot be compensated from the federal budget. They have made the payments and that’s that. This is what the current regulations tell us. It was all transferred. On June 16, the money that came from the Finance Ministry began to be paid out on top of the money that the Stavropol Territory budget allocated. They had two billion on their accounts, I think. Yes, they had money on their accounts and they made the payments. There was a situation there when people were asked to pay for getting the needed documents. This was the case with the expert organizations that delivered the document concluding that their housing was no longer fit for use and that were entitled to a state housing certificate. People were asked to pay 5,000–6,000 rubles for this. The situation was rectified and people had their money returned. The only problem was that the banks then took a commission from people for the return of the payment. Then there was a fee of around 1,800 rubles that Rosreestr [the Federal Service for State Registration, Cadastre and Cartography] demanded to issue a certificate confirming that this was a person’s only home. The Stavropol Territory authorities say that this matter has been settled now and people had their money returned. Check whether it was returned or not. That is the first thing. Second, rules must be set for once and for good to ensure that this kind of nonsense does not happen again. People lost everything they had and the state gave the money to support them, and then you have these various organizations each trying to take something from them, 1,000, 3,000, 5,000 rubles. There was another problem too there that you should be informed about. When the money came into the accounts of people affected by the disaster, if these people had debts, the Federal Penitentiary Service deducted this money from their accounts and no one informed them that these people were disaster victims. This matter also needs to be regulated because these people could not make use of the money they had been paid as disaster relief. Ms. Golikova, please draft proposals for the needed legal amendments. Yes, Mr. President. I have one more point to make. I think this is also an important issue and the instruction can only come from you. The Otkaznenskoye reservoir in the Stavropol Territory, the water management system that overflowed its banks, was built in 1965. The project documents for the facility show that it needed to be cleaned after 31 years. It is 62-percent silted up. There was such heavy rainfall that the level rose too far. This reservoir is currently the federal budget’s responsibility. I think we have quite a number of such facilities. This water management system is the responsibility of the Agriculture Ministry, not the Natural Resources Ministry. Set this all out in writing, please. Yes, we have done so. 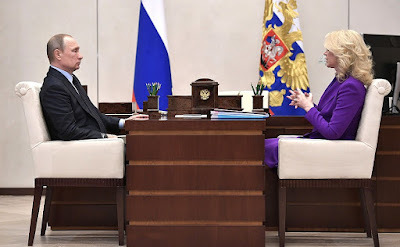 0 Comment to "Putin met with Accounts Chamber Chairperson."